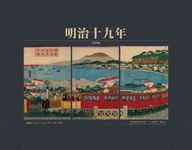 Please post a game here if you plan to bring it to the convention, or if you want someone else to bring it; I'll seed the list with 18xx titles from the BGG Library. Please thumb the list if you think you want to play at least one 18xx title during the convention. We will be meeting in the Glasscock room, the same location as last year. Note well, though: The Glasscock room is officially a general-purpose quiet games room. We cannot reserve empty tables for 18xx if people come in looking for table space to play other games. 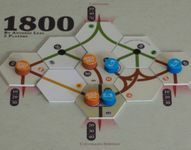 I expect that in addition to formally scheduled games there will be a lot of pick-up 18xx played. (How often do you get to say that!) Just show up in Glasscock and ask when the next game is likely to start. 9 am seems to be popular. Please add a "me too" comment if you plan to bring a second copy. Welcome! We would love to teach you! Would really like it if someone could give this a go with me, or guide me and my Dad through it. I can bring my copy. I'd love to play this again. NOTE WELL: Allocate the whole day for this. Does someone have chips or do I need to beg Johnny Office for his? I'd like everyone who is playing to at least read the rules beforehand; if requested I'll show up early to teach. If possible have an opinion on whether to use 5 or 10 shorts; we'll go with majority of those who express an opinion as the game starts. What the Hell are YOU staring at?! The BGG library has a copy of this. I can bring this if we have a confirmed table; I'd be especially interested in playing before the con starts. I'm not sure the best way to do this. I'd like to play an 1846 game. There is already an entry for a (full) game I can't make. So, this is a new entry to try to start up a second. Aliza, could we please borrow your copy? Thanks for letting us borrow the game Aliza! I've played a couple of times, so I can explain if needed. I could also bring this one. Except for Tuesday, my availability is limited to evenings. 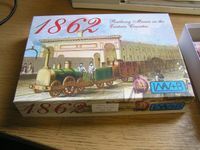 I will have a copy of 1862 with me fresh from Essen. I'll consider bringing this one if there's enough interest. 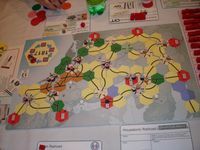 This is a good game for teaching newcomers to 18xx; it is very similar to 1830 but has a lot of the sharp edges rounded off. 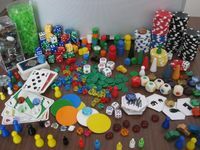 The BGG library does not have a copy; in 2011 at least 2 people brought it. The BGG library has a copy of this. Another good learning game. I will have 18Ruhr with me from Essen last year. I can bring this. Note that, except for Tuesday, my availability is limited to the evenings, and lord only knows what business meetings may come up. A 3rd one I could bring (I'll only bring 1 or 2 max). My availability is limited to evenings except for Tuesday. My girlfriend has a copy of this one, and I think she's planning on bringing it. We won't be at the con until Friday though. Poker Chips. Who is bringing them?